Yoga with Melissa 115 is on Lakshmi. During the last hatha yoga class in a series on Vishnu, we will focus on Lakshmi, the Goddess of Abundance. 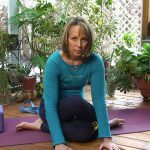 The concept for this class came from Danny Arguetty’s book, Nourishing the Teacher: Inquiries, Contemplations and Insights on the Path of Yoga. Instead of focusing on lack in our yoga postures, we will focus on what is going well in our practice. 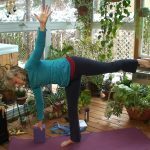 This class encourages you to find your own personal abundance in each pose. This way you can acknowledge and appreciate the gifts already in your possession whether they are physical, spiritual, material, emotional or mental. Following the teachings on Lakshmi we come into a reclined position for hand to big toe pose and some hip releases. We then come up to kneeling to release your spine in cat pose. Pigeon pose further releases your hips before you come up to standing. From standing we do two variations of moon pose – standing half moon pose (the side bend) and balancing half moon pose. This is followed by breath of joy. Our inversion today is shoulderstand followed by fish pose. We round out our hatha yoga class with a reclined cow’s face forward fold and then a seated cow’s face forward fold.